The Cobblers recovered from a goal down to see off Hull City Under-23s in their pre-season friendly at the Lomas de Campoamor complex in Spain. Dean Austin's men wrapped up their six-day trip to Alicante with an impressive victory, responding strongly after falling a goal behind seven minutes into the second half to notch up a fourth straight pre-season victory. Sam Hoskins levelled the scores on 61 minutes, before late efforts from Aaron Pierre and Shaun McWilliams wrapped things up. Boss Austin named different teams for each half, with all members of the travelling party playing some part, except for Shay Facey who is recovering from an ankle injury picked up in last week's win at Brackley Town. Two players started both halves, and they were Jack Bridge and Sean Whaler. Town enjoyed a lot of the early possession but clear-cut chances were at a premium. Bridge had a lively game and was involved in much of the action. The former Southend United man went close to opening the scoring on the half hour mark, cutting in from the right and sending in a left footed shot that was tipped wide. John-Joe O’Toole tested the Tigers keeper with a header from a Matt Crooks free kick 10 minutes before the break, while O’Toole was close again moments later, sending a left foot volley just wide. The Cobblers conceded their first goal of pre-season on 52 minutes when a low cross from the left was converted, but the Tigers' lead didn't last long and Town were level nine minutes later when Hoskins volleyed home a left wing cross from Bridge. Hoskins then forced the Hull keeper into a smart save with a low shot, with Sam Foley's follow-up blocked on the line. Town were the dominant side now, and on 70 minutes Pierre headed wide from a corner. The same player eventually edged Town in front with five minutes left on the clock, heading home a Dean Bowditch corner, the former Milton Keynes Don man making his first appearance of the summer. 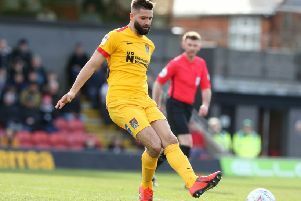 Hull pressed for a leveller, but it was the Cobblers who made it 3-1, with McWilliams netting in the final minute after Kevin van Veen held the ball up and teed him up. The result rounded off an excellent week for the Cobblers, who return to the UK tomorrow ahead of Sunday's open day at the PTS Academy Stadium, and Tuesday night's first home date of pre-season against Barnet.